The lumbar spine nocebo effect is a major cause, perpetuator and escalator of low back pain. The nocebo effect surrounds low back pain patients in the medical system and is well-known to have significant and far-ranging consequences on a patient’s general health and future prognosis. Most patients do not even know what the nocebo effect is or how it has already hurt them in many tangible ways. Nocebo is a fascinating phenomenon that we have covered in many articles on The Cure Back Pain Network. The concept of nocebo transcends mindbody medicine and goes to the heart of the human psyche. When patients finally understand how the nocebo effect has been fostered during the diagnostic and treatment phases of their care plan, as well as how we are bombarded by the nocebo effect in media on a daily basis, the only possible result is extreme anger. However, this anger is the starting point towards a real cure for many patients who will take the time and effort to read this essay and understand how the information already applies to their lower back pain. This patient guide examines and explains one of the most important ideas you can understand as a chronic pain sufferer: the power of the nocebo effect. If you really want to begin your road towards recovery, this essay is a must read to get you on the right path towards a cure. Nocebo is a foreign concept to many. However, most have heard of placebo. A placebo describes a positive health effect provided by a treatment, advice or just information, even though the treatment, advice or information has no actual therapeutic value. In essence, the mind creates benefit since it believes the treatment, advice or information has value. Placebo treatments have been widely studied and have been proven to reverse a diversity of injuries and diseases including cancer and various forms of chronic pain. Nocebo is the opposite of placebo. Nocebo describes treatment, advice or information that imparts a harmful effect to overall or specific health, despite having no direct pathological component. Basically, the person suffers some negative consequence due to exposure to the treatment, advice or information, even though the exposure is not inherently harmful unto itself. This occurs because the mind clearly recognizes the implied or directly stated negativity of the source and therefore creates negative effects within the body. A diagnosis of any structural abnormality in the spine causes nocebo, regardless of whether the irregularity is pathological or not. The condition might not be painful, but learning about its existence is known to create pain or escalate pain. This is proven scientifically in a vast number of studies regarding diagnostic evaluation of lower back pain. Collectively, we have been told by numerous sources that the lumbar spine is weak, incapable and susceptible to injury. We have all heard horror stories of chronic lower back pain and its debilitating effects. 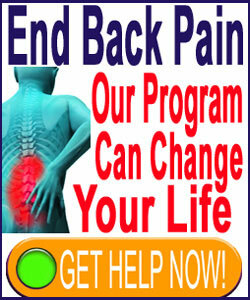 This information has created a universally-held association between the low back and chronic pain. We all basically accept this at a very deep level of consciousness. The media is continuously bombarding us with advertising for injury attorneys, drugs, surgical techniques and chronic pain information. It seems that we are expected to have pain and therefore, we develop it and never recover from it. There remains a literal mountain of misinformation when it comes to the causes of lower back pain and the mostly innocuous nature of most spinal abnormalities. Instead, we are subjected to falsehoods on a daily basis, telling how any change in spinal structure MUST be painful. There is no evidence to support this false idea and volumes of evidence disproving it. Take heart, the lower back is not at all weak or deficient. It is amazingly strong and capable! The nocebo effect can have terrible consequences on general health or specific health issues. It can cause pain. It can perpetuate pain. It can escalate pain. It can retard the healing process. It can suppress the immune system. It can kill. Working with chronic pain sufferers for most of my adult life, I can honestly say that I rarely see a person who is not suffering (and that is the best choice of word) under some sort of nocebo effect. If this effect can be broken, then the patient stands a much better chance of recovering from whatever ails them, be it lower back pain, fibromyalgia, TMD, carpal tunnel syndrome, hypertension, headaches, skin disorders, gastrointestinal concerns or many other problems. When exposed to nocebo effect, the mind makes choices below the level of consciousness as to how it will react. We may have our conscious opinions about the accuracy of the ideas we are exposed to, but the subconscious is the real decision maker. If the mind chooses to accept the negative influence of the nocebo, then detrimental health consequences will surely follow. If the mind chooses instead to dispute the accuracy of the ideas, then the opposite effect can occur. In these circumstances, continued exposure to the same old nocebo information can actually help to defeat pain and bring an end to chronic suffering once the subconscious has declared these ideas to be worthless. So, how can one recognize and diffuse the nocebo, rather than fall victim to it each and every time exposed? This is a difficult question to answer, since nocebo has become an inherent part of modern medicine. Doctors no longer foster attitudes of good health. Instead, they treat illness. There is a distinct difference. Worse still, the body is no longer viewed as a human organism. Instead, it is grossly over-compartmentalized into the smallest functional units and then subjected to all manner of testing to seek out dysfunction without providing any balanced information about how the human mindbody, in its entirety, can fix these problems organically. The path towards beating the nocebo effect is different or each patient, but the journey really does need to be undertaken. To assist those who are interested, we have covered the topic of nocebo in vivid detail in our best selling and peer-acclaimed books, Cure Back Pain Forever and The Power of Fear. I can also highly recommend reading Dr. John Sarno’s books, even if you do not subscribe to all the ideas contained therein. His description of the power of the nocebo effect is both accurate and wonderful and is surely some of his best work.